We all want to be happy. But how is that possible when the world is going to Hell? Fortunately there is an answer and Gavin has found it. The best bit is, you don't need to change your religion, take any drugs, read a book, join a multi-level marketing business or even attend a wanky seminar to find it. All you have to do is buy a ticket to Gavin's show, have a laugh and all will be revealed. It's that simple! 'Happy' is a stand-up show that may just leave you smiling for the rest of your life. 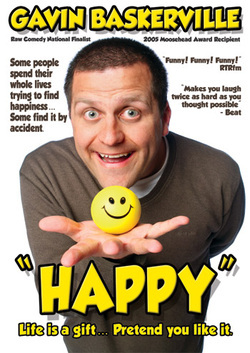 'Happy' is the fifth Melbourne International Comedy Festival show from 2005 Moosehead Award recipient Gavin Baskerville and showcases his best stand-up material and his engaging and enlightening comedy style.